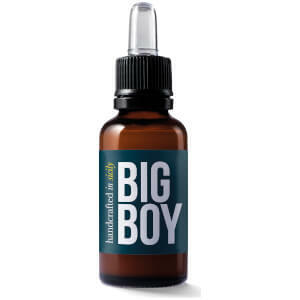 Explore the range of natural, luxury skincare for the man of today from Big Boy here at Mankind. Founded in 2015, luxury male grooming brand Big Boy began selling haircare and skincare products made with rich, natural ingredients. Both co-founders received hairdressing training in TONI&GUY salons and expanded their expertise with their own salons and celebrity clientele. They met in Dubai and decided to combine their skills to create their own luxury grooming range. Originating in Sicily, each product is specially designed for the modern man to work together with the skin’s natural elements. The Big Boy Beard Wash is a gentle, nourishing beard shampoo made with active softeners and conditioners for soft, fresh facial hair. Produced in small batches in their artisan Sicilian laboratory, each bottle is crafted to perfection to effectively lift away dirt and grime. Formulated with argan oil and natural surfactants, this beard wash leaves beard bristles soft and comfortable feeling with a delicate sandalwood aroma. It’s also sulphate, sodium and paraben free. To use, simply lather up on a wet beard and rinse away with warm water. The Big Boy Moisturizing Cream is a delicate facial hydrating cream which leaves skin feeling quenched. Lightweight and soothing, its unique formula contains olive oil, argan oil, vitamin E and squalene extracted from plants; preventing premature skin ageing and keeping skin from becoming dry and flaky. Containing antioxidants and SPF20, free radicals are kept at bay whilst collagen production is boosted.